Your dog can expect a full day of exercise and attention from our professional, caring staff. A day filled with socialization and activity which alleviates negative behavior at home due to boredom or lack of exercise. Dogs are highly social and need regular exercise to behave their best. Daycare is the best place to get all that done while you are busy. Drop them off for an hour or two, a half-day (up to 5 hours) or a full day (up to 12 hours). 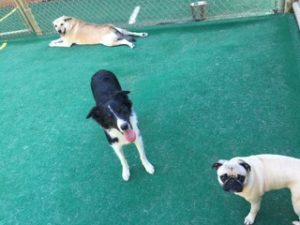 Once your dog has experienced the joy of daycare, you’ll get to experience the joy of a happy, satisfied and loving dog. Supervised play in safe, controlled indoor and outdoor play areas. Qualified dog trainers on site. Large outdoor fenced in areas for maximum playtime. Come join the fun at our new Dog Daycare Facility! If you would like to join our dog daycare, please give us a call to schedule an orientation with our trainers. You are welcome to download a copy of our daycare contract, as well as a copy of our 3-week integration plan. The plan gives you an idea of what your dog would go through with each of their first 9 days in daycare.